Check out this gently-used 2009 INFINITI G37 Coupe we recently got in. AWD - Clean CARFAX - No accidents - Fully Serviced - QUALITY CERTIFIED up to 12 MONTHS , 12, 000 MILES WARRANTY This INFINITI includes: [P01] PREMIUM PKG Mirror Memory CD Player Seat Memory Auto-Dimming Rearview Mirror Universal Garage Door Opener Adjustable Steering Wheel Generic Sun/Moonroof CD Changer Bluetooth Connection Sun/Moonroof Premium Sound System Driver Adjustable Lumbar MP3 Player *Note - For third party subscriptions or services, please contact the dealer for more information. * Enjoy driving? Well now you will get more thrills behind the wheel thanks to the heightened performance of AWD. Better handling. Better traction. Better driving experience. This low mileage INFINITI G37 Coupe has barely been touched. It's the next best thing to buying new. Added comfort with contemporary style is the leather interior to heighten the quality and craftsmanship for the INFINITI G37 Coupe With all records included, drive away confidently knowing the complete history of this INFINITI G37 Coupe x - Clean CARFAX - No accidents - Fully Serviced - QUALITY CERTIFIED up to 12 MONTHS , 12, 000 MILES WARRANTY. Rare is the vehicle that has been driven so gently and maintained so meticulously as this pre-owned beauty. Fast? That doesn't even begin to describe it. Get behind the wheel and take it for a spin to see just what we mean. This car has an exceptional paint finish that shows no sign of age or wear. 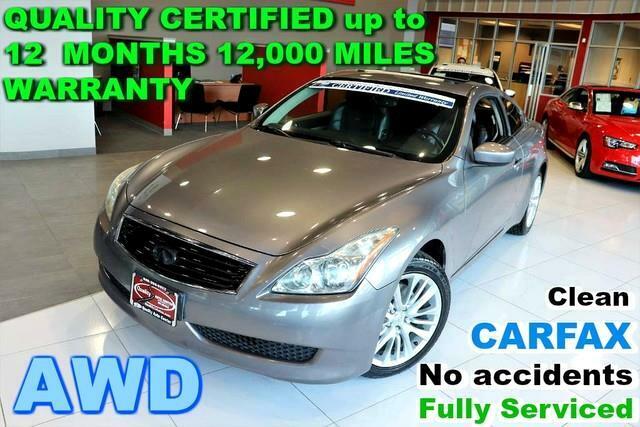 This unbelievably rare INFINITI G37 Coupe x - Clean CARFAX - No accidents - Fully Serviced - QUALITY CERTIFIED up to 12 MONTHS , 12, 000 MILES WARRANTY is a perfect example of The Best Man Can Build. More information about the 2009 INFINITI G37 Coupe: Both INFINITI's 2009 G37 sedan and coupe offer sharp-edged performance but also luxury-car comfort. INFINITI has positioned the G-series to compete with BMW's 3-series luxury performance cars. This means the G37 features great seats, an elegant interior with attractive materials and very impressive audio systems. Both G models stand out for offering overall performance near the top of its class. The new coupe manages to step up its performance capabilities without reducing driver comfort, with a rear limited-slip differential, 4-Wheel Active Steer system and Sport Brakes on the options list. Strengths of this model include attractive interior, Performance, and stylish design No Credit / Bad Credit / No Paystubs, No problem !! ! All Approved ! Everyone drives ! CLEAN, GORGEOUS, LOW MILES, SHOWROOM CONDITION. CALL NOW QUALITY CERTIFIED up to 10 YEARS 100,000 MILE WARRANTY , To Certify a vehicle, there will be an additional cost for Certification. CALL NOW For details. STUNNING AGGRESSIVE LOOK ON THIS BEAUTIFUL--Call today to schedule a test drive... Good Credit/Bad Credit/No problem!!!! Get paid cash? No problem!! 100% Credit Approval with interest rates starting at 2.49% for qualified customers, our rates will not be beaten. We price our cars at wholesale price to guarantee the best deals for our customers. Our inventory moves quick, please call to confirm the availability of the vehicle of your interest Springfield location 973-564-0112. This vehicle is located at our SPRINGFIELD location. Come visit our new showroom in Springfield NJ. Contact Quality Auto Center today for information on dozens of vehicles like this 2009 INFINITI G37 Coupe x. Enjoy safety and stability with this all-wheel drive vehicle and drive with confidence in any condition. In addition to being well-cared for, this INFINITI G37 Coupe has very low mileage making it a rare find. This is the one. Just what you've been looking for. More information about the 2009 INFINITI G37 Coupe: Both INFINITI's 2009 G37 sedan and coupe offer sharp-edged performance but also luxury-car comfort. INFINITI has positioned the G-series to compete with BMW's 3-series luxury performance cars. This means the G37 features great seats, an elegant interior with attractive materials and very impressive audio systems. Both G models stand out for offering overall performance near the top of its class. The new coupe manages to step up its performance capabilities without reducing driver comfort, with a rear limited-slip differential, 4-Wheel Active Steer system and Sport Brakes on the options list. Interesting features of this model are attractive interior, Performance, and stylish design No Credit / Bad Credit / No Paystubs, No problem !! ! All Approved ! Everyone drives ! CLEAN, GORGEOUS, LOW MILES, SHOWROOM CONDITION. CALL NOW QUALITY CERTIFIED up to 10 YEARS 100,000 MILE WARRANTY , To Certify a vehicle, there will be an additional cost for Certification. CALL NOW For details. STUNNING AGGRESSIVE LOOK ON THIS BEAUTIFUL--Call today to schedule a test drive... Good Credit/Bad Credit/No problem!!!! Get paid cash? No problem!! 100% Credit Approval with interest rates starting at 2.49% for qualified customers, our rates will not be beaten. We price our cars at wholesale price to guarantee the best deals for our customers. Our inventory moves quick, please call to confirm the availability of the vehicle of your interest Springfield location 973-564-0112. This vehicle is located at our SPRINGFIELD location. Come visit our new showroom in Springfield NJ.